Don Partridge brought a breath of fresh air to the British pop charts in the late 1960s with the hit songs Rosie and Blue Eyes. The fresh air was literal, for Partridge’s forte was not the recording studio but playing outdoors — as a busker on street corners, in bus shelters and anywhere else he could find a pitch. He was a veritable one-man band, blowing into a kazoo or harmonica while playing his guitar and crashing a bass drum and cymbal strapped to his back and which he controlled with his elbow and a pedal attached to his foot. His chart achievement was based on his ability to turn this novelty street act into a warm and engaging sound on record. At the height of his commercial success in 1969, he hired the Albert Hall, London, and gloriously filled its famous stage with a procession of the capital’s finest buskers and street entertainers. Born in Bournemouth in 1941, Partridge led a colourful early life. He left home at 15 and had a variety of manual jobs while supplementing his income by his activities as a cat burglar. 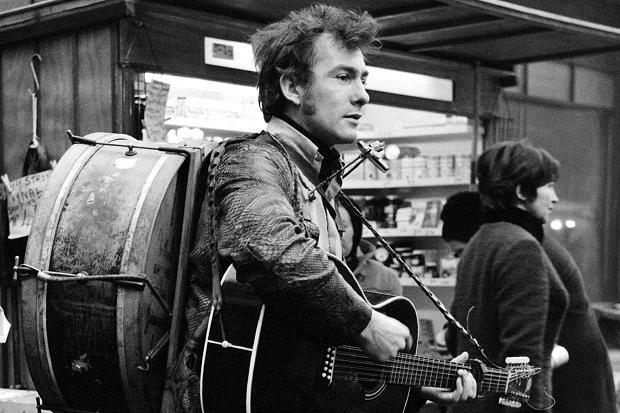 By the early 1960s he was an itinerant musician, bumming around Europe, as did many other English folk musicians of the time, including Davy Graham and Donovan. Partridge initially played solo guitar, singing English and US folk songs to a simple finger-picked accompaniment. In his repertoire were numbers made famous by the US folk-blues singer Jesse Fuller, such as Beat it on Down the Line and San Francisco Bay Blues. And it was from Fuller that Partridge copied the one-man band approach, finding that as a busker he attracted more attention by adding kazoo, harmonica, cymbal and a bass drum which bore the words: “InterGalactic Lord of the Wide Open Spaces”. By 1964 he was back in London performing on the streets with his friend Alan Young. They were frequently moved on by the police and, on occasion, arrested and fined for obstruction. He also played the folk clubs but never felt he quite slotted in. “I was really half-circus act and half-street singer, so I didn’t fit into the traditional musical mould,” he later said. He is survived by four sons and two daughters from three marriages. His break came in 1967 when he was invited to appear on the Eamonn Andrews Show. His appearance gave him national recognition and a recording contract swiftly followed when he was signed to EMI. His first single was his own composition, Rosie, which reached No 4 in the British charts in early 1968. It was followed within months by Blue Eyes, which rose to No 3. His first self-titled album was released that same year and included blues-folk tunes by Leadbelly and Big Bill Broonzy alongside his own compositions. Commercial success made it difficult for Partridge to return to the streets and he was soon appearing on a package tour with Gene Pitney, Amen Corner and Status Quo. But he was also determined not to abandon his roots and in early 1969 he hired a double-decker bus and packed it with street entertainers on a “Buskers Happening” tour, which concluded at the Albert Hall. He ran the entire event as a kind of buskers co-op, with all performers taking an equal share of the proceeds. An album, The Buskers, was released and Partridge scored his last chart hit in 1969 with the single Breakfast on Pluto. He then formed the acoustic folk-jazz fusion group Accolade with fellow guitarists Gordon Giltrap and Wizz Jones. Accolade recorded two albums before breaking up in 1971, when Partridge, disillusioned with the mainstream music industry, returned to busking. He lived in Sweden for several years and turned up as a busker again at the 1976 Olympic Games in Montreal, Canada. He put his peripatetic ways behind him when he settled in Seaford, Sussex, in 1990. He continued to busk around the South Coast into his sixties and even made an album The Highwayman (2001). The inclusion of his 1969 hit Breakfast on Pluto in the 2005 film of the same name revived interest in his music and he made a couple of appearances on the BBC TV comedy music quiz show Never Mind The Buzzcocks.